Shop signed Bubba Watson memorabilia from the world of golf. Our collection features autographs of the great man on a variety of golfing items. Signed Bubba Watson golf clubs, caps & photos. Many with signing proof, all with free UK delivery, fast worldwide shipping & Certificate of Authenticity. A man who needs no introduction in the world of golf – sporting legend Bubba Watson is one of the most celebrated and respected players of all time. Born in Bagdad, Florida, Watson (real name Gerry Lester Watson) started playing golf at high school, joining the Milton High School team. Before he attended the team had entertained future PGA Tour members including Heath Slocum – perhaps a sign of what was to come for the young amateur golfer. He went on to play for Faulkner State Community College in Alabama before transferring to the University of Georgia, helping lead their Bulldogs team to the SEC title in 2000. He turned professional one year later, joining the Nationwide Tour before qualifying for the PGA Tour the following year. Within just a few years he was making waves and earning big money – cementing win after win until 2012, when he secured his first championship win at the Masters in a sudden-death playoff. Two years later came his second Masters win – which he won by just three shots. In 2015 he reached his career-high 2nd place in the Official World Golf Rankings. Watson is amongst the longest drivers on the PGA Tour – he can hit a ball over 320 metres and is capable of generating a ball speed of up to 194mph. In total he has multiple major victories, winning the WGC-Dell Technologies Match Play and WGC-HSBC Champions in addition to his two Masters championship wins. 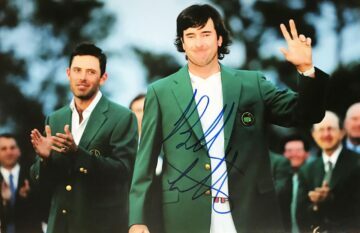 Here at Firma Stella we have a fantastic selection of signed Bubba Watson golf memorabilia. 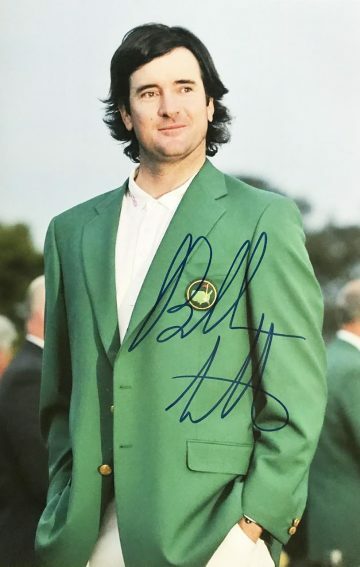 We carefully source a diverse range of ephemera including Bubba Watson signed balls, gloves, bags and clothing autographed by the sports star. Each and every item is supplied with a certificate of authenticity for full peace of mind.